The advisor Born in New York trades from borders of support and resistance clouds. The advisor looks for bar clouds in any timeframe: M5, M15, M30, H1, H4, D1. Green borders are defined by a bar cloud. The yellow stripe inside it shows a bar cloud which is used to define it. Red borders mean the advisor could not find a bar cloud. This happens when the price moves higher or lower than the currently known maximum or minimum price in the chart. 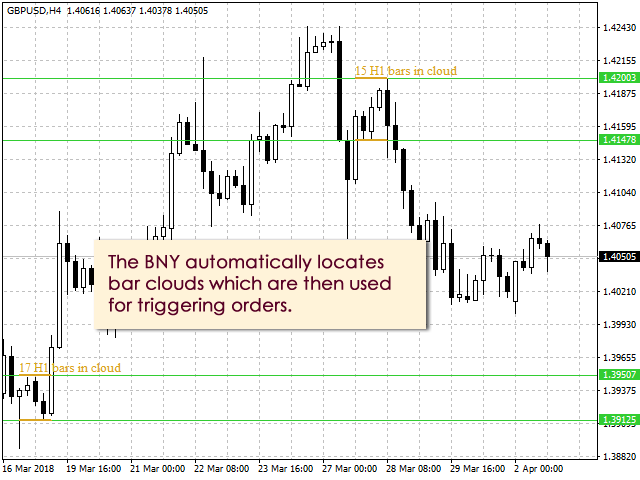 In this case, borders are defined by adding or deducting the value of the range property from the current price. 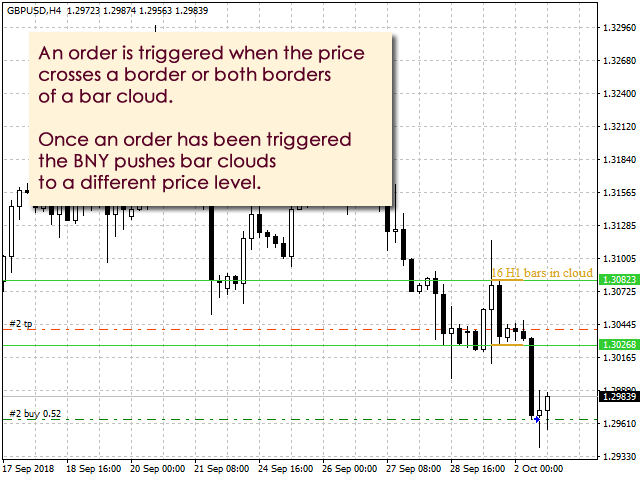 2) Price crosses one border of a bar cloud (a rollback order). bars_in_cloud - a minimum number of bars to define a bar cloud. The more bars there are, the more difficult it is to find a cloud. compensation - if an order is not profitable for a long time, other orders try to compensate it. All orders close when the compensation value (total profit in points) is reached. Set to zero to switch off. flat_hours_start - start of flat hours, that is when the NBY does not open orders. Crossing cloud borders during the flat hours is often false. You should indicate night hours as flat hours for any European currency pair. flat_hours_end - end of flat hours. 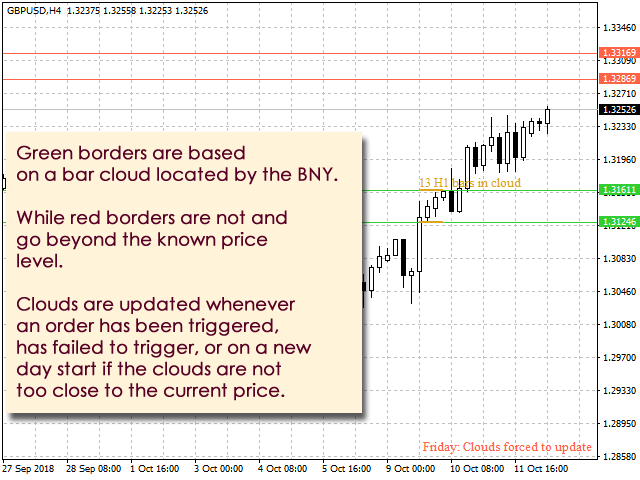 range - a distance in points from the current price to the top or bottom bar cloud. The larger this distance is, the more time it requires to get to a cloud and open an order. stoploss - use points, not pips. takeprofit - use points, not pips. Set to zero for the advisor to try to find a takeprofit level by H4-bar maximum or minimum bars. timeframe - a timeframe for finding clouds. A timeframe shift using the MT4 bar panel has no impact on this property. Only the following values are used: 0=M5, 1=M15, 2=M30, 3=H1, 4=H4, 6=D1. trail - use points, not pips. trigger_distance - a distance in points from a cloud border to open an order. volume_per_trade - a fixed volume (example: 0.03), or a percentage from the available equity (example: 0.05%). You must use the percent sign for the latter. zero_auto - number of hours after which the zero can be engaged. The smaller this number is, the more orders might be closed with a zero profit. The advisor Born in New York is good to optimize in the Strategy Tester. The default trade properties are good for trading wih the following instruments: AUDUSD, GBPUSD, NZDUSD. The advisor can, of course, be traded with any other instrument, but you will have to optimize its trade properties using a standard optimization technique. I will either add or update sets of properties for trading with different instruments. Do stay in touch to get the updates for this product! 1. I changed the allowed volume verification because some brokers disregarded this parameter.